There's a lot of hype surrounding Windows 10 right now and I'm not sure why. I notice several problems and no real benefits. Everyone is saying to just upgrade, but I don't feel like upgrading to something that is hugely inefficient and spies on me. If anyone has a good reason to upgrade, let me know in the comments. Why do Windows and Office get bigger and slower with each release? Windows XP came on a CD and a typical installation could fit in a couple of gigabytes, let's say just under 2 GiB. Windows Vista and up come on DVD's and a typical installation takes about 15 GiB. Why is that? I use Windows 7 and it works very well for me but I don't know what it could possibly have that would take up an extra 13 GiB compared to Windows XP. Upgrading past Windows 8.1 just doesn't make sense in my opinion. More importantly, we all know Windows 10 sends usage data to Microsoft. How much is it sending? We probably won't know until there's a data breach and it ends up in the news. Another thing to ask is, why was Windows 10 free? And why did the free offer last so long past the deadline? I was able to activate Windows 10 using my Windows 7 COA in April 2017, long after that was supposed to stop working. An article on howtogeek.com says this still works as of January 5, 2018. They write, "it’s also possible Microsoft will look the other way and keep this trick around to encourage more Windows 10 upgrades for a long time to come." At first I thought it was just a way to get free beta testers, but I suspect it also has to do with the data collection. If something is free then you're (usually) the product. I hear that people are quitting Facebook because of privacy and data collection issues, but what if using Windows 10 is just as bad as using Facebook, or even worse? Windows 10 could provide far more data than any social network since it can potentially watch everything you do. The biggest problem with Windows 10 may not even be the data collection, but instead the forced updates. It almost feels like Microsoft owns any computer running Windows 10 and they're just letting you use it. I heard that they're also moving to a new driver signing system where you have to pay to get kernel-mode drivers signed before Windows 10 can use them. This reminds me of how Blackberry phones won't run native C++ apps unless they're signed by a Blackberry-issued certificate, even for development. Thankfully Blackberry's signing process is free, but it's still not cool to have to get permission to run things on your own devices. Windows should not be as locked-down as iPhone and Blackberry. Recently a family member bought a laptop from Wal-Mart but after I explained how bad Windows 10 is, they took my suggestion to migrate their old laptop's Windows 8.1 license. After I installed Windows 8.1, I found out that many of the new laptop's devices only had drivers for Windows 10. It seemed odd since Windows 8.1 isn't that old. I've never seen a hardware manufacturer support only one version of Windows, but that was how it was for this laptop. 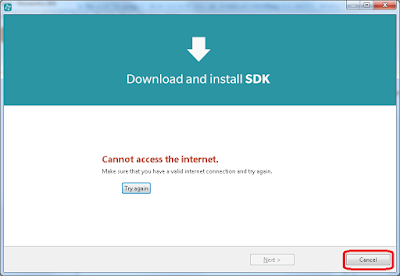 I tried everything, including unzipping the installers and attempting to manually install the drivers, but nothing worked. It turns out that Intel, the company that made the laptop's CPU, graphics, and Wifi, doesn't want to support anything below Windows 10. I can almost understand with the GPU and Wifi, but since when is an x86 CPU intended for only one version of Windows? 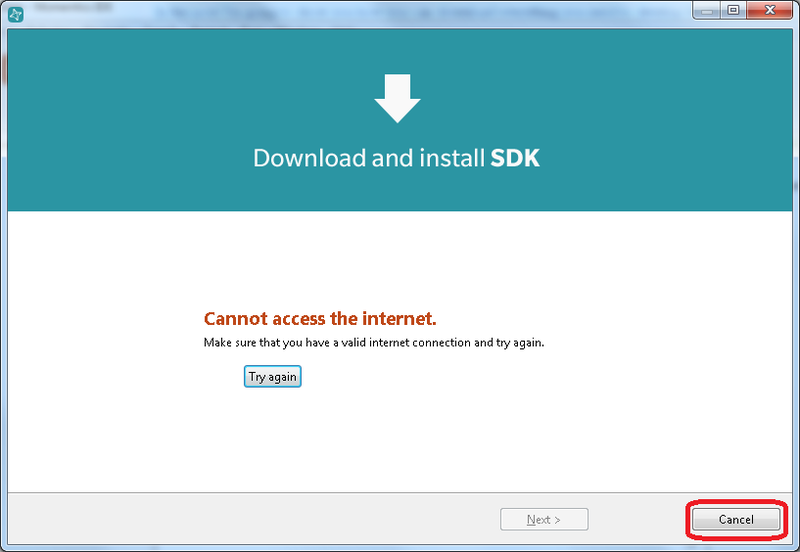 In the end, I was asked to just install Linux. I set up Ubuntu and now everything works like it should, without the data collection. I've decided to keep using older Windows versions as long as possible. I use Windows 7 on my desktop and XP on my laptop. And yes, my laptop is online. I also dual-boot my desktop with Windows XP so I can use an old analog video capture card. I really like Windows XP because of its simple interface and low requirements. Everyone seems to freak out when they hear of people keeping an XP system on the Internet. I know about viruses like WannaCry, but as I understand it, they depend on someone to run them before than can infect a LAN. I'm behind a firewall and I'm always careful about what I download so I don't see a problem yet. I'm not saying Windows XP is for everyone. In fact, I only recommend it if you're a power user who can secure it properly. Even then, it's probably better to use Windows 7 since it has better software support. I can see that Microsoft, Intel, and probably others are planning to push everyone they can onto Windows 10. To prepare, I've archived my Windows ISO's on an external hard drive and downloaded a large collection of offline update installers. In fact, as I write this, I'm downloading all the updates for Windows Server 2003, XP, 7, 8, and 8.1, and Office 2003 and 2007. Here are some OS options if, like me, you want to avoid Windows 10. If possible, I'd say to stay with Windows 7 as long as possible unless you're using a tablet, in which case I think Windows 8.1 is best. You should acquire and archive Windows 7 installation media and updates now, just in case Microsoft tries to kill this version later. After I installed Windows 7 and activated it, I used DriveImage XML to make a drive image so I can revert to a fresh installation whenever I need to. I can see Windows 7 being supported by software and most hardware for a long time so this should be a good option for quite a while. There are many apps that run on Linux such as Chrome, Opera, LibreOffice, 4K Video Downloader, and Veracrypt, so switching to Linux might work for you. It might be your only other option if you get a new computer. I know many people disagree, but I think Windows 8.1 is great for tablets. Unfortunately, the Windows 8 app store seems to be losing apps rapidly. If you're interested, you should acquire and archive Windows 8 installation media. I use this every day on my laptop and it works well for me. It has decent software and hardware support but be prepared for some recent software to not work. I'll probably publish and maintain a list of XP-compatible software and hardware in the future. Above: an excerpt from the Windows 7 Pro license agreement. It looked and acted just like regular 32-bit Windows XP, and I was surprised at how many current 64-bit apps run on it. The downside is that it requires special drivers. I've observed some drivers to work in 32-bit Windows 7 and XP, but 64-bit Windows 7 and up cannot share drivers with 64-bit Windows XP. It turns out that 64-bit Windows XP uses a different driver model, one that it shares with Windows Server 2003 x64. Because 64-bit Windows XP is so rare, it's hard to find drivers for it but I think searching for drivers for Windows Server 2003 x64 might help. I was able to find a 64-bit XP driver for my GTX 750 Ti, but some Sandisk flash drives don't work. I installed Chrome 70 beta and tried the playlist. Sure enough, when I right-clicked and chose "Stats for nerds", it said the video was in AV1 format. I tried the URL in 4K Video Downloader and it showed a bunch of unknown entries in the MP4 category. The article mentioned AV1 only being available up to 480p, so I wondered why there were so many options and why they went up to 40.3 MiB. I downloaded the largest one and tried to play it. MPC-HC didn't recognize the codec but thankfully I just had to update it. Once I did, I was able to play the video. The file turned out to be 1080p, so YouTube must have encoded higher resolutions after the article was written. MPC-HC was able to play it at the full 29.97 fps on an Intel Core 2 Quad CPU. It also played surprisingly well in the browser at 1080p. The only issue I noticed is that the downloaded file had no sound. 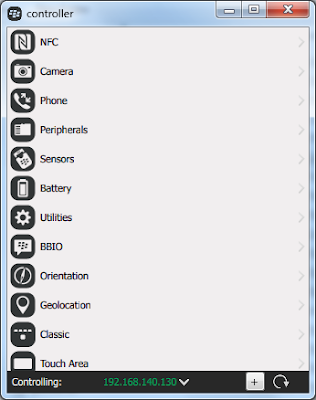 Recently I've become interested in developing for Blackberry 10. 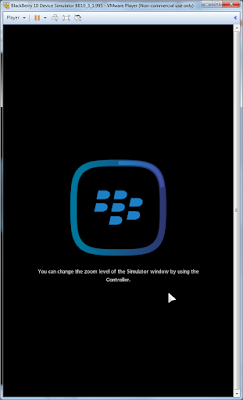 After getting set up, I learned that Blackberry's security is so tight that you can't even run homemade apps on your own phone without a key from Blackberry's servers. I also heard that they would be closing their app store at the end of 2019, which concerned me because I didn't know if they would allow developers to keep writing apps after that. I asked about it on Reddit and via direct email to Blackberry, with mixed responses. Fortunately, after I asked about it a Blackberry rep told the community that there are no plans to disable the app signing process, so we should be able to keep writing apps after the app store closes. 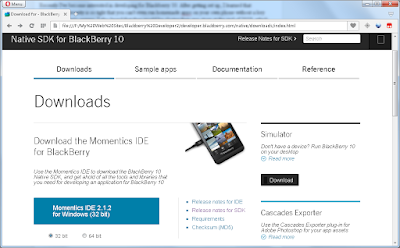 I decided to archive everything I could from Blackberry's official app development sources, including developer.blackberry.com and the entire BlackberryDev YouTube channel. The YouTube channel is not as interesting as the website, but I thought I might as well get everything in case things start getting taken down. 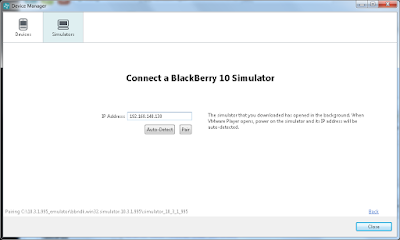 In this post I'm going to show you how you can download everything you need to develop for Blackberry 10 and install it from disk, in case Blackberry's site goes down. This obviously won't help if they can't sign your apps, but perhaps a solution for signing will be found by the time it's needed. First, I downloaded developer.blackberry.com using HTTrack. 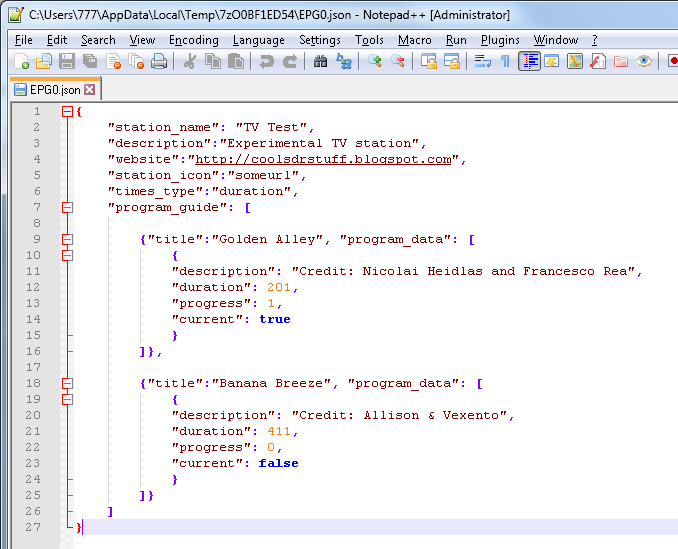 The way I configured it, it was able to get the entire website, including the API documentation and many ZIP files. Unfortunately, I must have made a mistake with my job file because it missed a huge collection of EXE files, so I had to make a list and copy-paste it into a new HTTrack job so I could get them. I decided to keep the two sets separate because the website and ZIP collection is 2.95 GiB, while the EXE set is 297 GiB, which is mostly phone firmware. 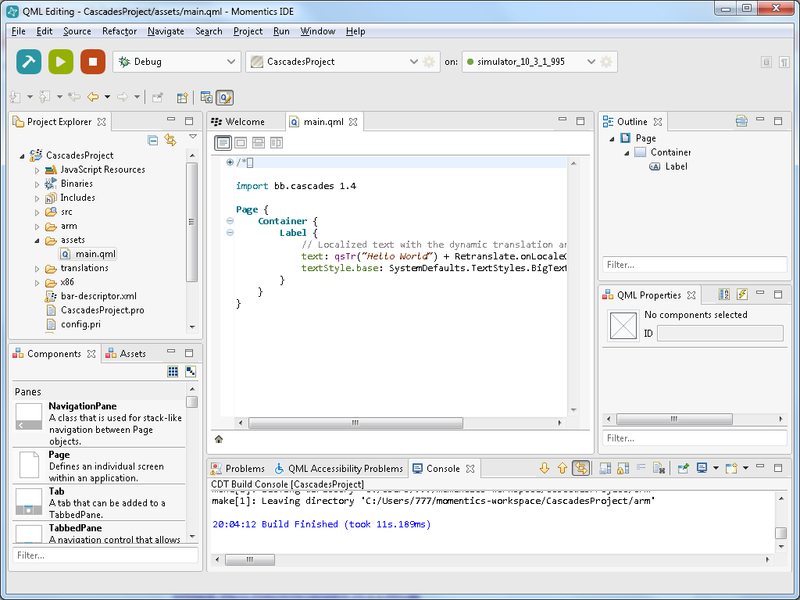 Anyway, to develop apps we need the Momentics IDE. The latest version right now is 2.1.2. Once you pick a version, download and install it. I'm going to use the 32-bit version and install it with the default settings so it will end up in C:\bbndk. 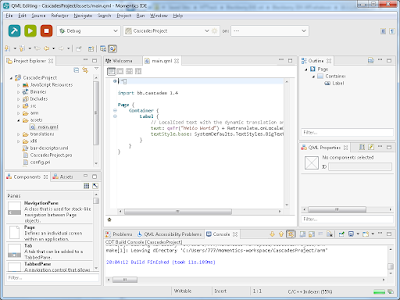 At the end, leave the option checked to start the IDE. I unplugged my Internet cable so I could demonstrate how to do this offline. Click Cancel. 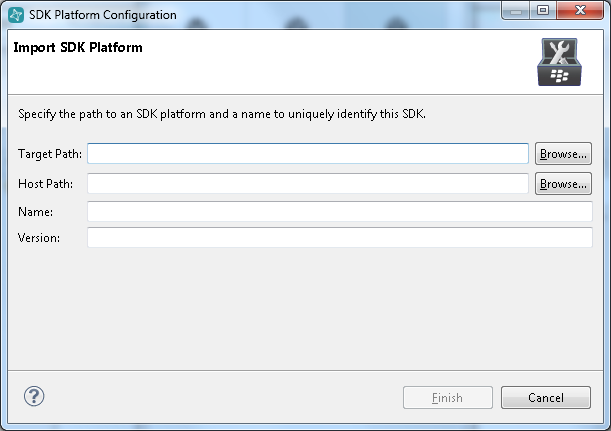 In the next dialog, go to the Custom tab. Note that this dialog will be much wider if you're connected to the Internet, because the other tabs will be populated. Download and extract them. I used the C drive, so they ended up in C:\[zip file name]\. 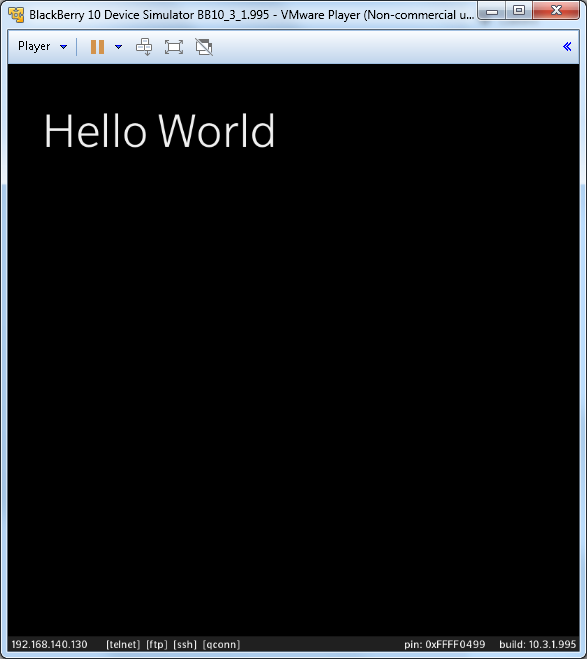 (Update) I couldn't get the visual QML designer to work and it turns out I was missing some files. http://downloads.blackberry.com/upr/developers/update/bbndk/ndktargetrepo_10.3.1.995/packages/bbndk.win32.cshost.10.3.1.995.zip (Necessary for the visual QML designer). These last three files will contain a folder called "target_10_3_1_995". Extract them to the same folder where you extracted win32.libraries.10.3.1.995.zip, so that the "target_10_3_1_995" folders from each zip file get merged with the one you already extracted. 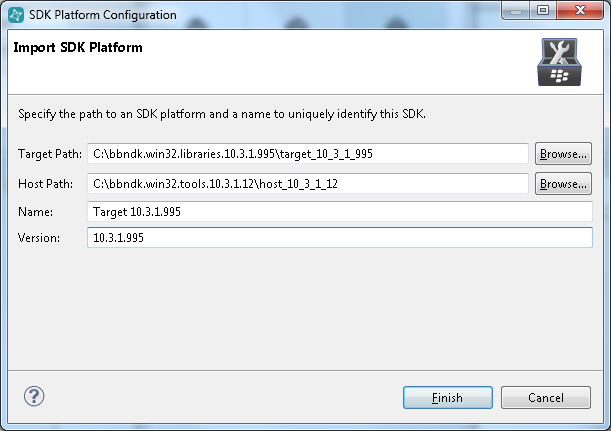 In the dialog shown above, click Add New Custom SDK. 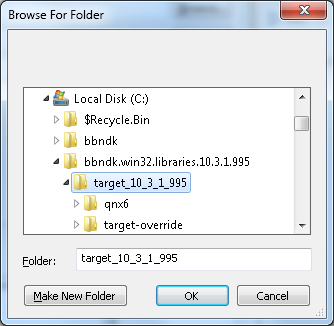 For "Target Path", click Browse and find the target folder from bbndk.win32.libraries.10.3.1.995. 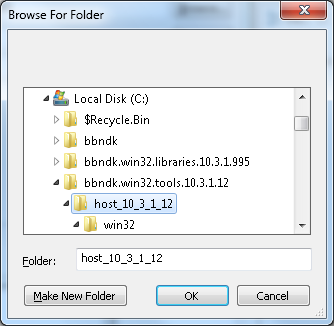 Now for "Host Path", click Browse and find the host folder from bbndk.win32.tools.10.3.1.12. In the Import SDK Platform dialog, change the Name field as desired. Now you have a fully functional API level so click OK.
(Update) If you want to be extra sure that you archive a working API level for offline installation, it looks like you can also use the automatic installer in the API Levels window to install an API, then close Momentics IDE and create a ZIP archive of your C:\bbndk folder. 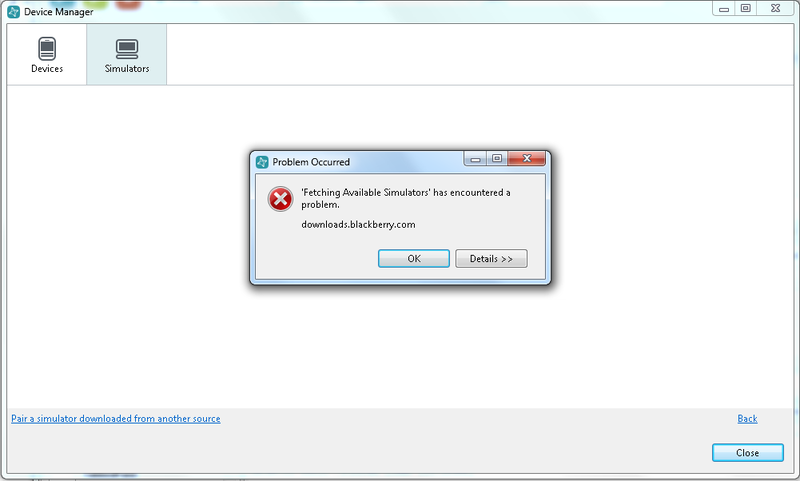 In the IDE, go to File->New->Blackberry Project. 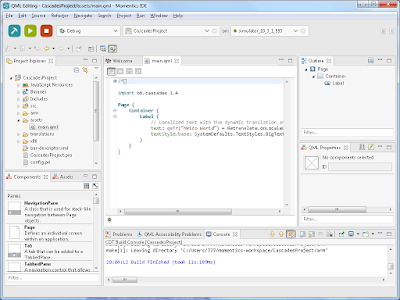 Just to finish the tutorial quickly, accept all the default options to create the project. Now you have a project ready to compile and run on a Blackberry 10 phone. Even though I have a BB10 phone, I don't want to have to get it set up and get a debug token yet, so let's use an emulator. First we need VMware Player. My computer can't handle the latest version but older versions are still available from the official site. They're unlisted so you have to know the direct URL. I'm going to be using VMware Player 7.1.0. Download this and install it. 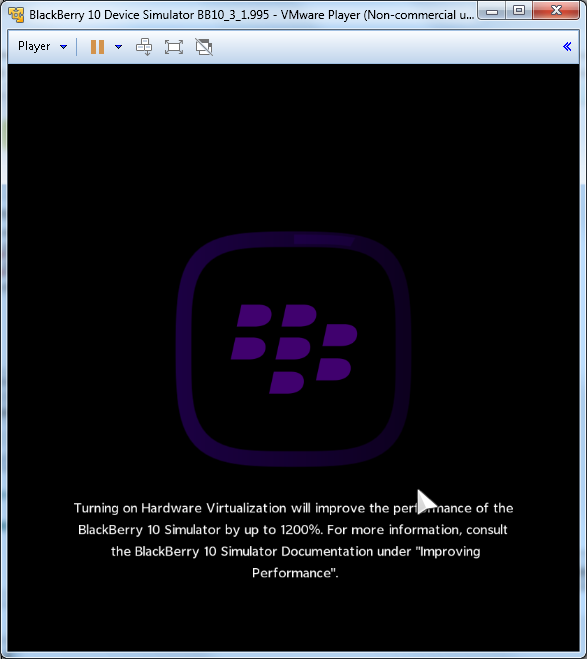 Now you need the Blackberry emulation files. These files contain everything you need to emulate BB10 phones of various sizes, like square screens with a physical keyboard, or regular "tall" screens. Download these and extract them to a folder called "10.3.1.995_emulator" or something similar. In the Device Manager dialog, go to the Simulator tab. You'll get this error if you're not online but that's okay because we already have all the files we need. Click OK on the error message, then click the link at the bottom left. 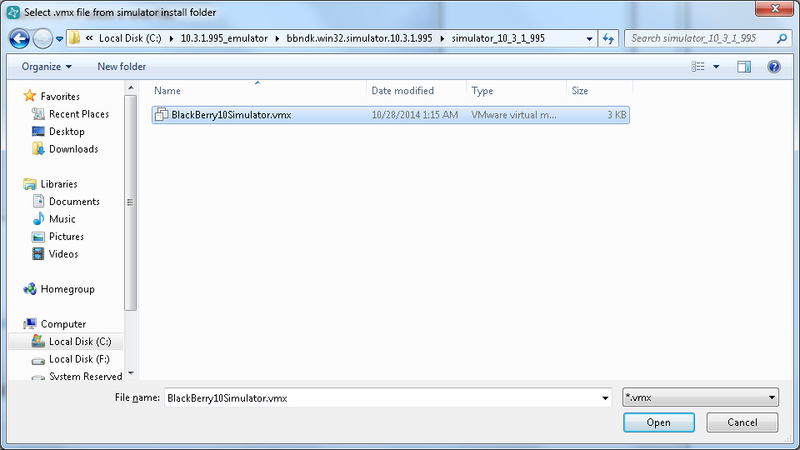 Browse for the VMX file within the bbndk.win32.simulator.10.3.1.995 subfolder. Click Open, then OK. 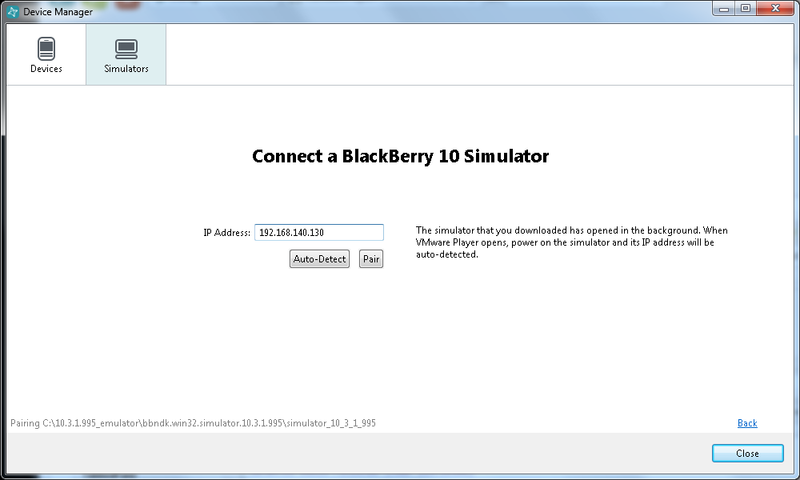 The simulator will start automatically. 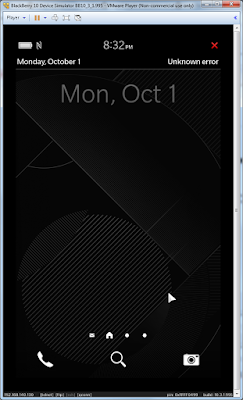 By default, it will pick a "tall" resolution similar to a normal smartphone. If you want, you can choose a different resolution before it starts. 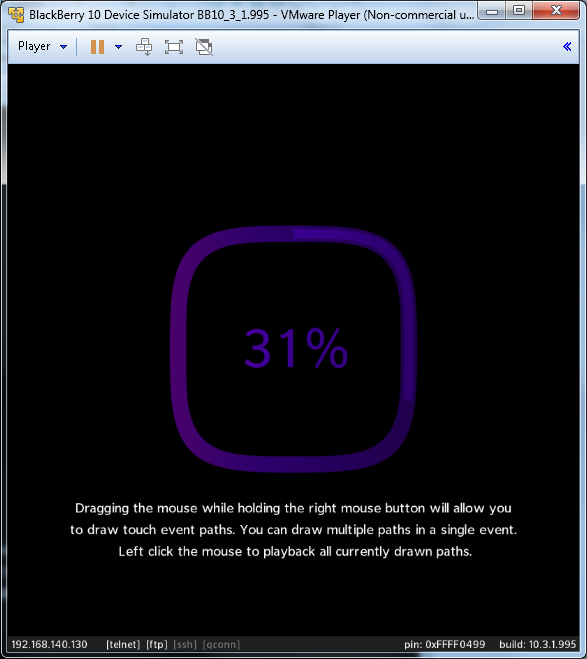 To do that, click in the VM to capture the mouse and keyboard, press Enter, and follow the prompts. To un-capture the mouse and keyboard, press Ctrl+Alt. 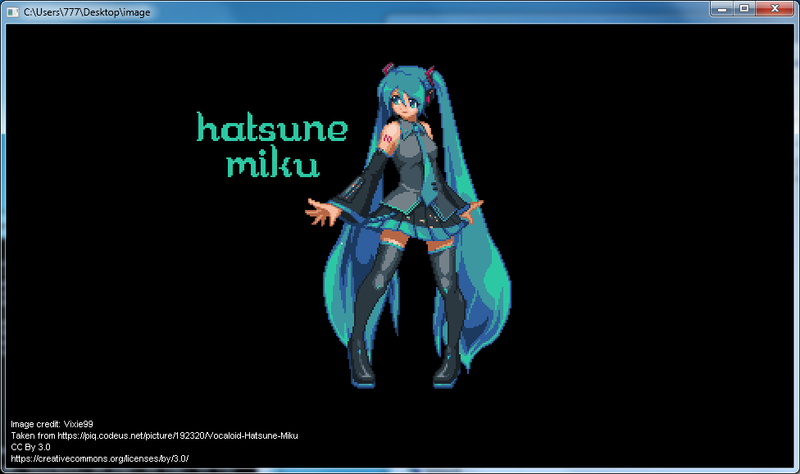 For this first test, we're going to let it use the default resolution. 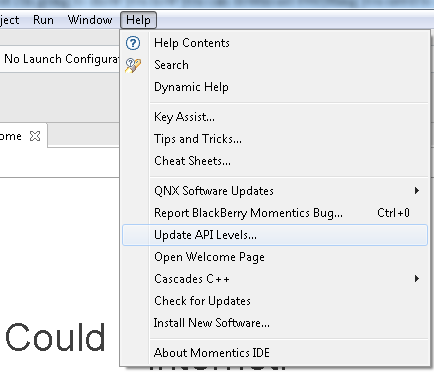 Back in the Momentics IDE Device Manager, it will ask for an IP address. It was entered automatically for me but if it's not automatic for you, you can find the right address at the bottom-left of the emulator. Now you have a working emulator that is recognized and listed by Momentics IDE's Device Manager. Notice that the "Open Controller" button is disabled. Since we installed from disk rather than the Internet, Momentics IDE doesn't know where to find the controller. 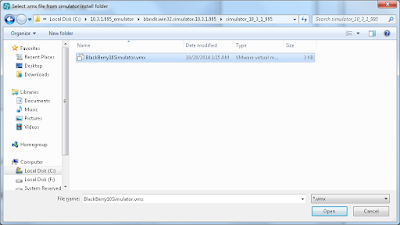 To start it manually, navigate to the bbndk.win32.simulatorController.10.3.1.995 subfolder where you extracted the emulator ZIP's. Go into the subfolders to find "controller.exe". The full path is shown in the address bar in the next picture. Again, mine was able to find the IP address automatically but if yours doesn't, you can enter it at the bottom. 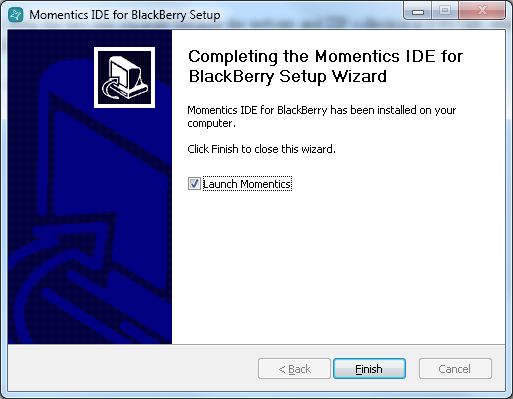 Back in the Momentics IDE Device Manager, click Close. 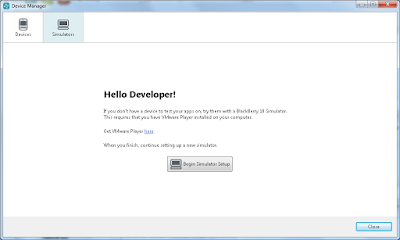 Notice that in the main IDE, you now have a valid simulator that you can run apps on. Try clicking the green play button again. Don't worry about these warnings. If you get an error dialog about a Java NullPointerException, just click OK and compile again. 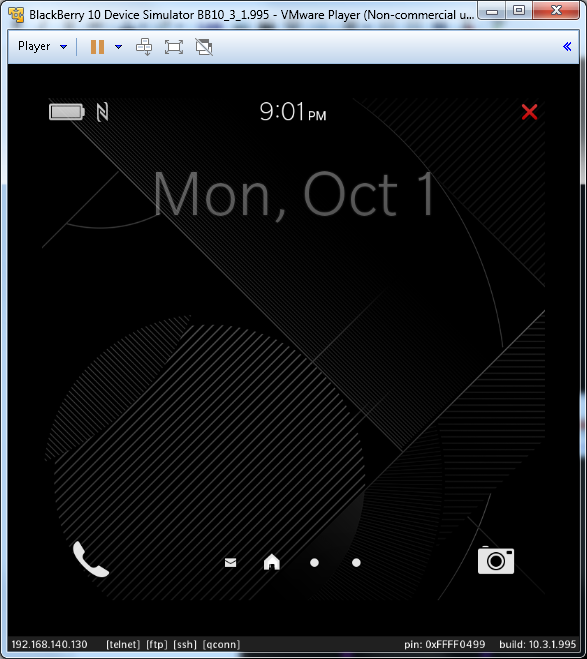 Let's try it again but with a 720x720 square phone. To do that, we'll close and re-open the emulator. 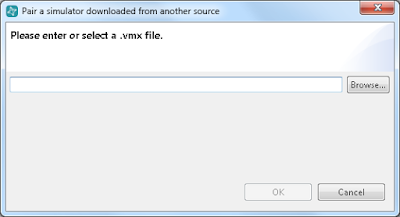 Once it starts, we'll click inside the VM, wait for the prompt, and press Enter, 2, and Enter again. Don't forget to press Ctrl+Alt to get out when you're done. 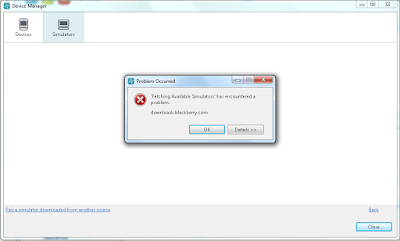 You may have to reconfigure the simulator in the IDE's Device Manager if it gives an error when you try to run the app. 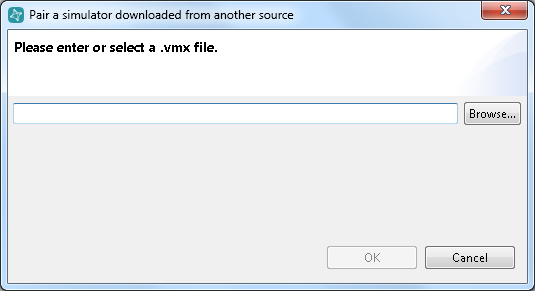 One time it said it didn't know the simulator's API level so I had to re-import the *.vmx file and pair it again. If you're successful, the app should look like this. I don't know why the color scheme is different for the BB10 keyboard phone. 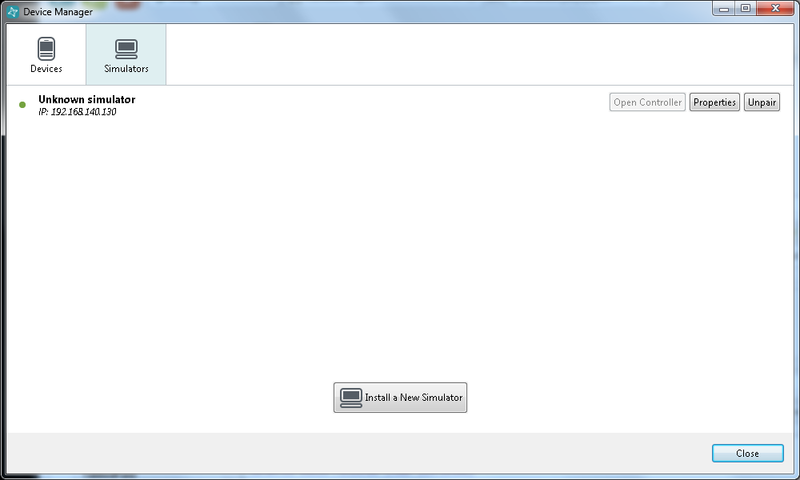 On a side note, this simulator is surprisingly fast. 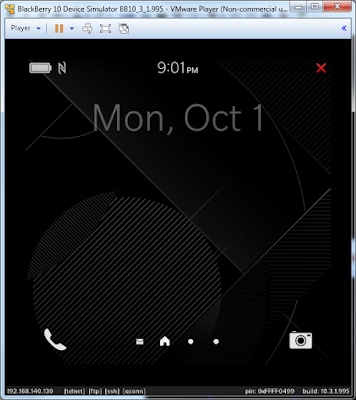 I ran it on a computer from 2011 with a Core 2 Quad and 4GB RAM and it feels as fast as a real phone. 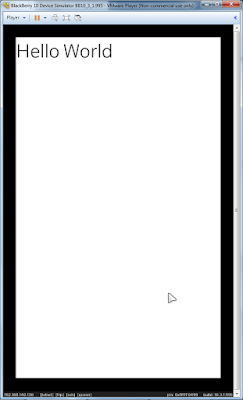 In contrast, the Android emulator is barely usable on the same computer. I've been looking for a way to mount 7-Zip archives as virtual drives, similar to how IMDisk works with uncompressed disk images. At first I wanted a method where I could read and write to the virtual drives, but that proved to be too much so I settled for a read-only solution. I found a free program called WinArchiver Virtual Drive. It supports 7-Zip, which is great. I tried it out and it was able to mount one of my archives as a CD drive. I navigated to the virtual drive and saw the contents of the archive. The problem was, when I tried to open a file, I saw a notice in the taskbar about an unsupported method, meaning compression method. The archive I had tried was compressed with LZMA2. I tried again with LZMA and it worked, but I didn't want to have to start using LZMA because it doesn't seem to compress as well. I looked in the installation folder and saw a file called 7z.dll, dated March 24, 2010. I tried replacing it with a newer copy from my 7-Zip installation, but that produced an error. Several weeks later, it occurred to me that I had tried to use a 64-bit DLL when the program and the original DLL were 32-bit. I had removed WinArchiver Virtual Drive so I reinstalled it and then went to the 7-Zip website and downloaded a 32-bit copy of 7-Zip. Not wanting to replace my 64-bit copy of 7-Zip, I was able to open the installer EXE in 7-Zip and get the 32-bit DLL I needed. After replacing the DLL from 2010, Win Archiver was able to mount and read archives compressed with LZMA2. The way WinArchiver Virtual Drive handles its cache seems flawed. First, if the archive is solid then the program has to extract the entire contents to disk. Having to extract the whole archive is perfectly normal if it's solid, but extracting to disk keeps you from accessing archives bigger than your free space. I can understand saving individual files to a cache, but even then it should ideally be done in memory if the files being accessed are small enough. The other problem is that the cache is not cleared until you unmount the drive. The way the program works currently, if you mount a non-solid archive you can access files quickly like you'd expect, and they're stored in the cache. The problem is, each new file you access is added to the cache and if you run out of space, the program will give an error and refuse to access any more files. This brings us back to the first issue, where you can't make full use of archives bigger than your free space. I released some UTSC packets for people to try and decode, to see if my format could be followed by other people. They contained a still image (instead of video since I don't have a VP9 encoder yet), music, an EPG, and some filecasts containing Bitcoin Cash blocks. Tech2025 was able to extract the EPG but couldn't get any further. There was another guy, Jess, who he introduced to the format. I was pinged on Discord and asked to share some details. I brought Jess up to speed and provided him with the packets and the format documentation. To be honest, I did help him a little, like with getting set up with a hex editor and explaining some of the byte structure. However, I let him do most of it so that we could honestly say he decoded it. The deal was that once someone decoded it, I would publish all the details of what was in the packets. I'm going to show what was in the first packet. This post will just describe the first one because the others are similar. Recall that UTSC packets contain just 1 second of content. The music is from Golden Alley, created by Nicolai Heidlas and Francesco Rea. 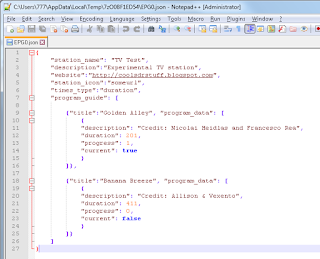 The EPG was a file called EPG0.json. It was contained within a 7-Zip archive compressed with PPMD. Note: the EPG format is not defined so these are just suggested parameters. The filecasts were split 7-Zip archives of the latest 3 Bitcoin Cash blocks at the time I created the packets. They were compressed with LZMA2. There is no need for me to share them here. Finally, I wrote a UTSC parser in Liberty BASIC to show and extract all the information quickly. I didn't release it until after Jess had finished extracting everything. I was an early bird purchaser of the LimeSDR Mini, and I acquired a pair for $99 each. They arrived on February 10, 2018. I described in a previous post how I was able to use them for receiving, but it wasn't until August 17 that I was able to transmit a clean and reliable signal. Right now, the transmit function seems to only work on Linux. 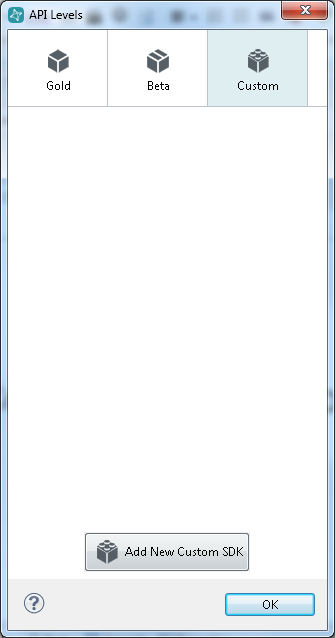 I tried on Windows and got varying results. 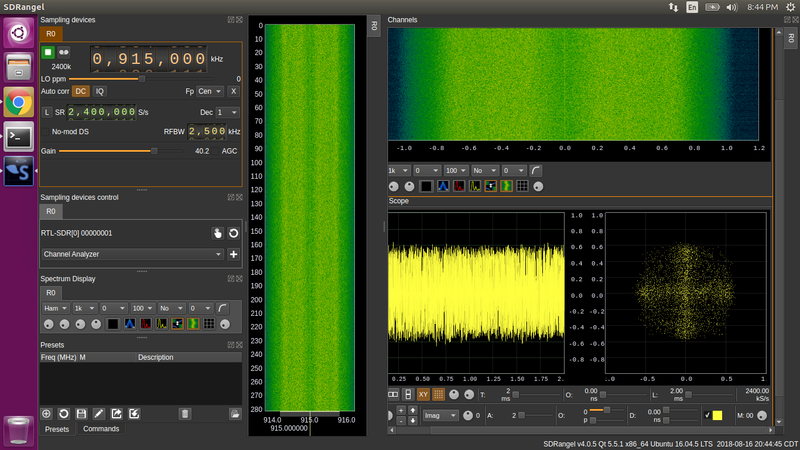 Initially I was able to transmit some distorted FM audio in the Windows version of GNUradio, but I could not transmit a digital QPSK signal. It's been a while since I tried, but I don't think I can transmit anything in Windows anymore. 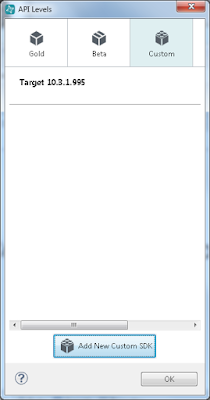 Currently, when I try to transmit from Windows, I get an unstable solid carrier. 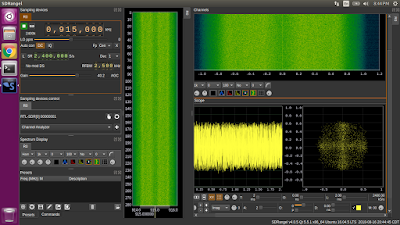 On the LostCarrier.Online Discord channel, Ballistic Autistic told everyone that he succeeded in transmitting good FM audio with his LimeSDR Mini from GNUradio on Ubuntu. I asked him if he would try QPSK and send me a reception screenshot, which he did. Once I knew that it was possible to make it work, I downloaded the GNUradio Live DVD image, which is a Ubuntu distribution, and used Universal USB Installer to install it to a flash drive. 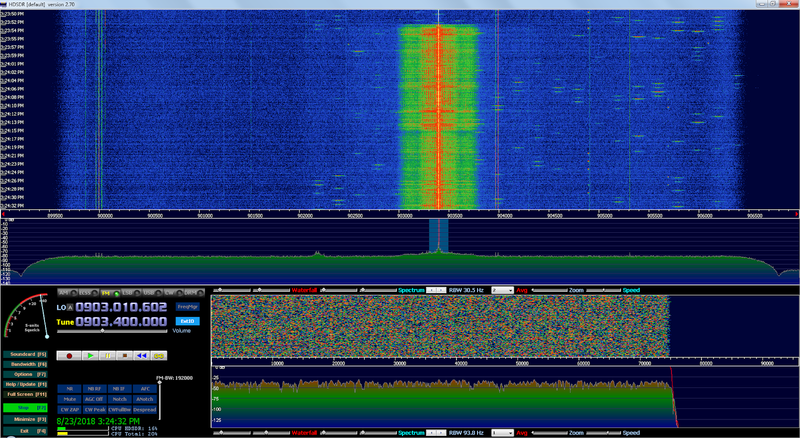 I installed the driver, compiled and installed gr-limesdr, and then had a working transmit setup. Since it's hard to find instructions for using the LimeSDR Mini, I'll explain the full process. I would recommend updating the firmware on your LimeSDR Mini, but I don't think it's necessary if you don't want to. 2. 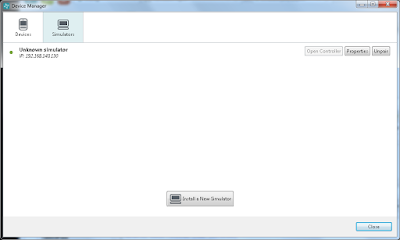 Install it to a flash drive using Universal USB Installer. I chose to have a 1GB persistent area. 4. Open a terminal (command prompt) and enter the commands linked here to install the driver in Ubuntu. 6. Visit https://github.com/myriadrf/gr-limesdr and enter the commands shown for Linux installation. 7. 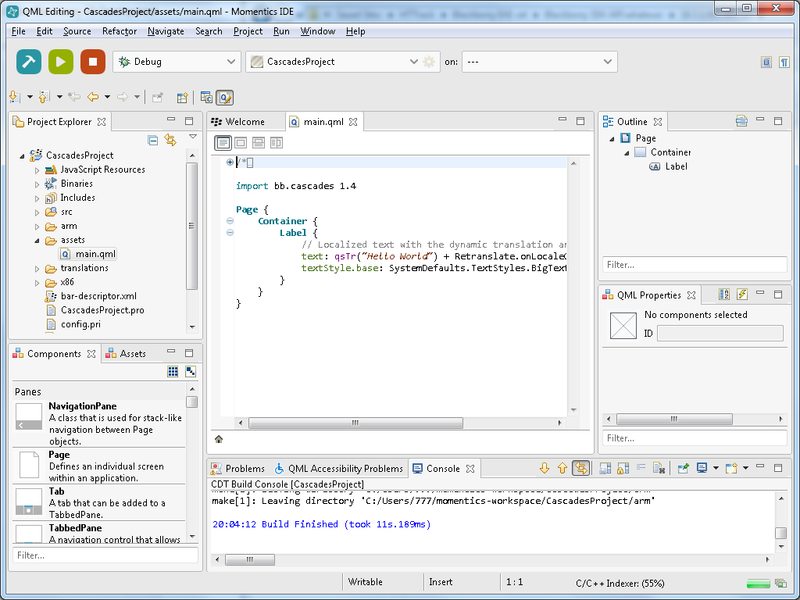 Open GNUradio Companion. You should now have LimeSDR source and sink blocks. You can click in the list of blocks on the right and press Ctrl+F to search for them. If you haven't already, plug in your LimeSDR Mini. Now let's put together a flowgraph to test the transmitting function. You should have a second SDR on another computer to receive with. Before starting, make sure you have a WAV file recorded as 48 kHz mono. In GNUradio Companion, click Open and you should see a "ubuntu" folder on the left. 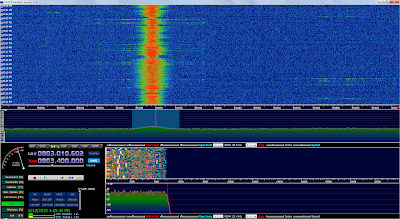 Navigate there if it's not already selected and then open gr-limesdr/examples/FM_transmitter.grc. 1. Remove the "LimeSuite Sink (TX)" block, and add a fresh one from the list on the right. 2. Connect the output of "Rational Resampler" to the input of the new "LimeSuite Sink (TX)" block. 3. Double-click the LimeSuite block and you'll see that the "Device serial" field is empty. Make sure your LimeSDR Mini is connected with USB, then open a terminal and run "LimeUtil --find". This will print a list of all Lime devices. Copy the serial number of yours and paste it into the LimeSuite block's "Device serial" field. 5. Choose an "RF frequency" that you want to transmit on. Even though there is very little transmit power, you want to choose a frequency that won't interfere with anything. I like 903.4 MHz but that's not usually license-free outside North America. Frequencies are measured in Hz, so you could type something like 903400000 or just 903.4e6, with e6 meaning MHz. 6. Set the "Sample rate" to 5e6, which means 5 MHz. Click OK.
7. Double-click the "Rational Resampler" block. Change "Interpolation" to 125 and "Decimation" to 12. Click OK.
output_rate = input_rate * (Interpolation/Decimation). 8. Double-click the "NBFM Transmit" block. Change "Audio Rate" to 48000. Change "Quadrature Rate" to 480000. Change "Max Deviation" to your desired FM deviation. I'm going to use 24e3 (24 kHz). Click OK.
9. Finally, double-click the "Wav File Source" block. For the "File" field, click the "..." button to browse for the WAV file you want to transmit. Once it's in the "File" field, click OK.
Connect a receive SDR to another computer, open your desired SDR program, and navigate to the frequency you chose. At the computer you'll be transmitting with, connect your LimeSDR Mini to an antenna and click the green play button at the top. The result should be clear FM audio. For some reason, I can't get my SDR to transmit on low frequencies like FM broadcast or the 6m ham band. 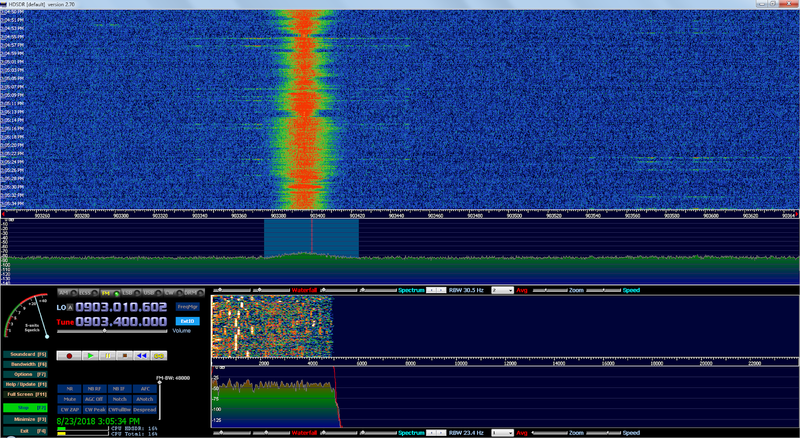 Frequencies like 400 MHz and higher work well, but 900 MHz seems to work best. For this experiment, I'm going to transmit a QPSK signal with a rate of 1.25 Mbit/sec. 1. Create a new flowgraph and follow the instructions in the previous example to set up a "LimeSuite Sink (TX)" block. For this section I set mine, on the CH0 tab, to use a digital filter of about 750 kHz. This makes the signal edges look cleaner in the waterfall. 2. Add the following blocks: "Constellation Modulator" and "Constellation Object". 3. Double-click the "Constellation Modulator" block. In "Constellation", point it to the "Constellation Object" block by entering its name, variable_constellation_0. Change "Differential Encoding" to No and "Samples/Symbol" to 8. Click OK.
We're going to try transmitting a "Random Source" with random values evenly distributed between 0 and 255, and optionally a file with non-random data. 4. Add a "Random Source" block and double-click it. Change "Output Type" to Byte, "Minimum" to 0, and "Maximum" to 255. Click OK.
5. Connect the output of "Random Source" to the input of "Constellation Modulator". Connect the output of "Constellation Modulator" to the input of "LimeSuite Sink (TX)". 6. (Optional) Now add a "File Source" block and double-click it. Change "Output Type" to Byte. 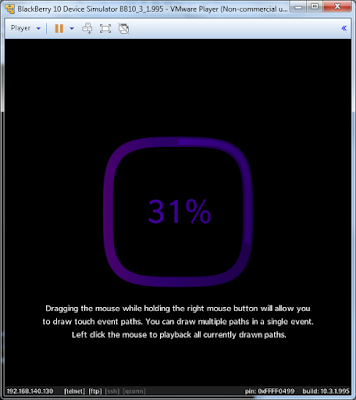 Choose a file and click OK. Right-click the block and choose Disable, then connect its output to the input of "Constellation Modulator". Click the green play button to run the flowgraph. For my optional file, I chose the Monero blockchain. Notice that the signal is not as smooth because the file isn't very random. If you want to switch between Random Source and File Source, just disable one and enable the other. 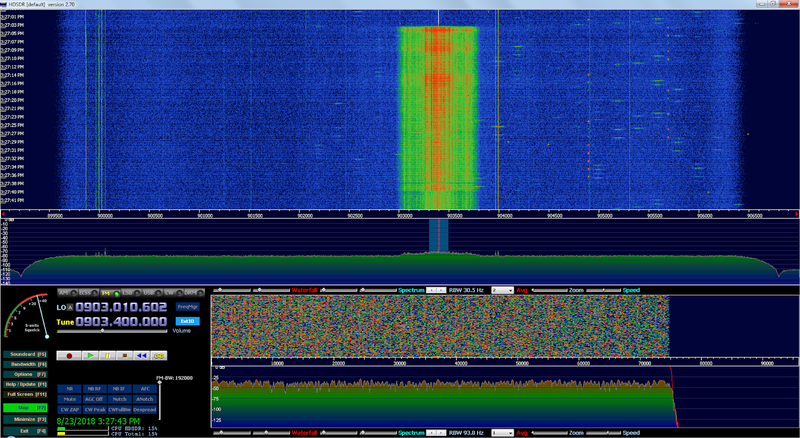 I had to reduce the transmit power by 5 dB for the random source because it appears to produce a much stronger signal. This experiment will produce a 16-QAM signal with a rate of 2.5 Mbit/sec. It will occupy the same RF bandwidth as the QPSK signal in the previous section. 1. Follow the instructions above to create the flowgraph but don't transmit yet. 2. Double-click the "Constellation Object" block and change "Constellation Type" to 16QAM. 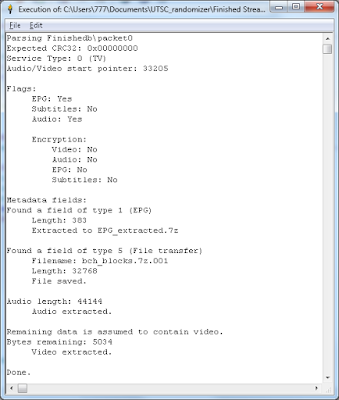 Click OK and then try transmitting. You'll notice that 16-QAM produces a smoother signal than QPSK. Like the previous section, the random source transmission power had to be reduced by 5 dB so the waterfalls would look the same.